Mary Poppins Returns brings back the magic of the P.L. Travers characters and a sequel to the classic Disney film from 1964. Just as before, the songs and score are connected to the film itself. In 1964 there was the Sherman Brothers (Richard M. Sherman and Robert B. Sherman) writing the music and songs with Irwin Kostel adapting and conducting. 54 years later, new songs carry much of Mary Poppins Returns. This time, we get songs by Marc Shaiman and Scott Wittman. Score is also by Shaiman, a 5 time Oscar nominee and Tony Award winner. I love a new musical, and I also love a good song score. Melodies of the songs are woven into the score, and are sometimes introduced as semi-leitmotifs before the song proper. Since about half of the soundtrack album feature the songs (and deserve a review all to themselves), I want to just focus on the instrumental score. 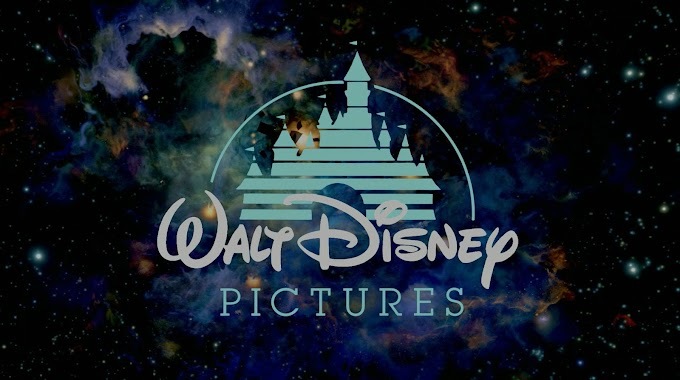 As like most original Disney soundtracks, songs are featured in the first half of the album and you'll have to make your own playlist to put them in chronological order with the score. After a brief introduction to Lin-Manuel Miranda's Jack, we get a full main title sequence with gorgeous painted backgrounds as we hear the Overture. Full of grand statements of themes - Can You Imagine That, Place Where Lost Things Go, Trip a Little Light Fantastic and Underneath the Lovely London Sky. 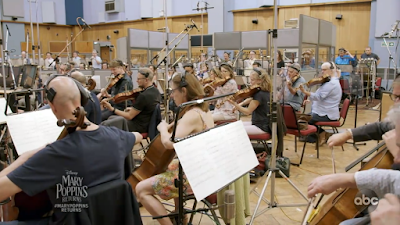 The orchestra sounds fantastic through this Broadway-style medley, and there's a little hint of Spoonful of Sugar near the opening. Theme from Mary Poppins Returns isn't in the film, but rather Shaiman's entry into his themes used both for the trailer and on set filming. It's used through the film as Mary's theme, which also becomes Can You Imagine That. Kite Takes Off uses the Lovely London Sky melody to represent Jack, as the orchestra whips up a bit of action and magic all while hinting at Mary's theme before a full sweeping thematic reveal. In the short cue Banks in the Bank, we hear more Fidelity Fiduciary Bank among sprightly woodwind writing. Into the Royal Doulton Bowl plays as we enter the animated world with the glitzy opening bits of Royal Doulton Music Hall mixed with Can You Imagine That. The melody on flute is jaunty, as it underscores their animated carriage taking them to the Music Hall. After Mary and Jack's performance of A Cover is Not the Book, we get a serious action cue in Rescuing Georgie. Shaiman shows off his orchestral writing here, giving the strings plenty to do, with woodwind and harp flourishes aplenty mixed with heroic statements of the Royal Doulton Music Hall verse as their scary animated adventure comes to a close. Off to Topsy's brightens back up as the group makes it to Topsy's upside down workshop. We hear a bouncier Mary's theme with a bit of The Perfect Nanny mixed in. A big band jazz sound first introduces the melody of Turning Turtle, before moving to the semi-Klezmer arrangement just like the song itself. Chase Through the Bank is a brief cue with a bit of suspense and action. Lost in a Fog is another shorter cue, setting the atmosphere with slow moving strings, choir and woodwinds. Goodbye Old Friend brings back the Lovely London Sky on piano, Mary's theme on solo cello and oboe, both melodies with that tinge of sadness even when the whole orchestra joins in. Race to Big Ben is the big action segment of the film, with all leeries helping the group get to Big Ben. Melodies jump around the orchestra, sometimes appearing as fanfares - Can You Imagine That, Trip a Little Light Fantastic, Place Where Lost Things Go and even another spot of Spoonful of Sugar. The momentum rises and falls with choir and chimes, both adding to the texture. End Title Suite is another lovely reprise of themes, beginning with the cheerful Nowhere to Go But Up. As the arrangement grows, the choir joins in. 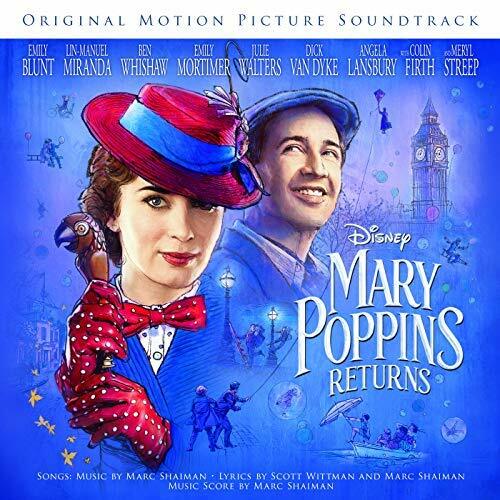 Turning Turtle gets a big band-style arrangement, Trip a Little Light Fantastic gets a big reprise, becoming sweeter for The Place Where Lost Things Go, a grand statement of Can You Imagine That and blink of Supercalifragilisticexpialidocious. I love how a song score can connect you to the material so much faster. 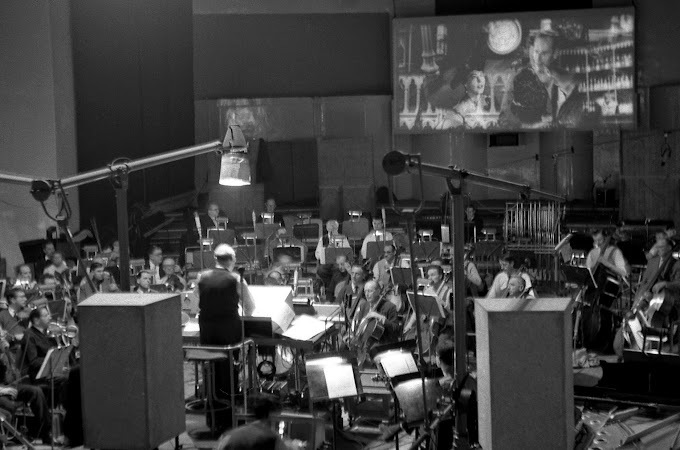 For example, Mary Poppins' theme was written before filming was finished - and was even played on set. It was also used right away in the theatrical trailers, the opening of the film, becoming the very backbone of Can You Imagine That and various parts of underscore. I can't think of a more joyful score from recent years. Tasked with following up to some of the most indelible music by the Sherman Brothers, Shaiman and Wittman came up with some delightful songs. Parallels can be drawn from the original songs by their place in the story and style, but they all work completely on their own. From there, Shaiman was able to utilize the orchestra in arranging the songs to weave throughout the score. Those bright brights and tender moments wouldn't be possible without the songwriting talents. The arrangements and orchestration team includes some Broadway veterans which give the orchestral pop that is just infectious to listen to. I like the use of some Sherman Brothers melodies - nothing too completely obvious, but just a wink for those that notice. The score tracks on the album are a great representation and really makes you want to hear it all. Beyond animated films, scores like this don't come around very often. The score and delightful songs are filled to the brim with joy with a sound both fresh and nostalgic. Like Mary, this music is practically perfect, in every way.